Death row inmates' champion Steve Bright always inspires me | Jon Katz, P.C. In 1991, I was still yearning to re-direct my career from the 25-lawyer corporate law firm that I had joined two years earlier , to something more meaningful. Ever since finishing law school, I went out of my way to meet birds of a professional and social justice feather, which ironically brought me in the same room with Clarence Thomas when he still headed the EEOC; followed with my standing shoulder-to-shoulder with a lone demonstrator outside the Chinese Embassy against the Tiananmen Square massacre; meeting Tiananmen Square surviving activists and Sigourney Weaver through the Lawyers Committee for Human Rights; taking out a High Times subscription in protest against a federal prosecutor’s subpoena of the magazine’s advertiser records; breaking bread with NORML’s then-national director Don Fiedler; reveling in Paul Krassner’s and others’ brilliant talks at the annual NORML conference; meeting the Lone Reefer, Jack Herer and others at a marijuana legalization rally near the White House,; getting threatened with arrest for exercising my First Amendment right to demonstrate against authorizing Gulf War I; marching two weeks later against Gulf War I; joining peace demonstrators at lunchtime during that war; meeting my peace mentor Jun Yasuda fasting on water for a month for peace in the Gulf; and joining the Washington Council of Lawyers at a gathering with Eugene McCarthy, who had me in stitches, including his emphasis about George Bush, I’s penchant for dropping pronouns in his sentences. And then I would return to my law firm the next business day and not share these experiences with anyone nor my views and feelings that led me to those experiences. Three things particularly helped me redirect my career to criminal defense in 1991, which were the inspiration of Don Fiedler to do so, the role model from death row defender Steve Bright, and the encouragement of members of the National Association of Criminal Defense Lawyers. During his four decades plus of practicing law, instead of kvetching about all the social injustice that surrounds us, Steve Bright digs right in and does more than his share working to reverse that injustice. After directing the Southern Center for Human Rights in Atlanta for over thirty years, Steve is moving on, continuing to teach at various law schools. I first met Steve in 1991 at a reception at the American Civil Liberties Union’s Washington, DC, legislative office after a death penalty oral argument by Charles Ogletree. At the time, I knew little about how giant were attendees Steve Bright and his brother anti-death penalty litigator Bryan Stevenson. I was chomping at the bit to move beyond my first law firm to do more enlightened work. When I asked Steve if he knew of any enlightened for-profit law firms, he said no, but then pointed me to an enlightened local three-lawyer private law firm lawyer, whose partner encouraged me to get out there and try cases. A few months later I was a public defender lawyer, serving hundreds of indigent criminal defendants for the next five years. Capital defense work at the trial, appellate and post conviction level calls for substantial time and devotion, to the point that a solo law firm practitioner can find at least fifty percent of his or her time working on that one capital murder case. That is true devotion, when done right. Steve Bright’s messages include that plenty of court-appointed lawyers for capital cases devote little more than cursory work and attention on those cases; that too many public defender systems are underfunded, overworked, and insufficiently staffed; and that the criminal “justice” system is riddled with racism. Steve continues to be both my hero and a continuing source of inspiration. The inspiration is the most important thing, because we need to carry on the work that inspires us, rather than merely looking up to those who do the work. That does not mean that I am duplicating Steve’s great sacrifices, taking pay under $50,000 at the SCHR and working long hours that make his hourly average pay all the lower. That is because he does not do his work for the money. He does it for justice. Before this month, I had met Steve Bright but once, at that 1991 ACLU reception. Recently I learned that Steve this month would be presenting his fourth career Supreme Court oral argument, having won the prior three arguments, this time addressing the reach of Ake v. Oklahoma to a captial habeas corpus proceeding in Arkansas. I arranged to attend the oral argument in this case of McWilliams v. Duff, but so had many others, with my ending up listening in the adjacent lawyers lounge. Steve stuck to his guns with every question from the justices, whether the supportive questioning of Justice Breyer, the skeptical questioning of new Justice Gorsuch, or the swing vote questioning of Justice Kennedy. After Steve’s case was concluded, I dashed out of the court’s front door, and waited at the bottom of the steps for his exit. 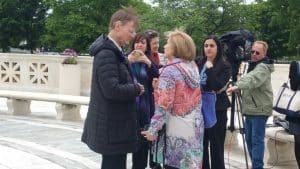 Steve emerged around five minutes later, talking with several of his friends and supporters near the court’s entrance, and ultimately walking towards NPR’s Nina Totenberg, who was waiting to interview him. I greeted Steve, reminded him my name, and thanked him for the decades of his inspiration to me and my criminal defense work. Steve took the time to give me a warm greeting, rubbed my arm, and proceeded to the many others who wanted to talk with him. I take it that Steve gives that same attention to everyone. Applying the concepts of non-duality, we are not separate from our heroes, which means that our heroes put us in touch with some of our best characteristics. That can sometimes be a challenge. Thanks to Steve for inspiring me on the right path. Deeply thanking and bowing to Steve Bright.